I have a new favorite ice cream flavor for fall. Rich and nutty winter squash gets the royal treatment with sweet maple and a kick of five spice. The weather has been hovering on the brink here: one day will be sunny and warm, the next will turn grey and cold. This ice cream bridges the gap. 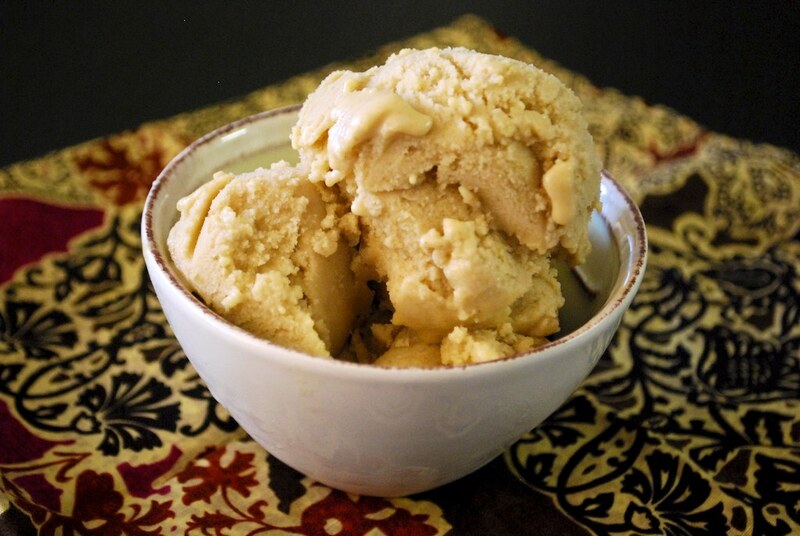 It’s got a warming blend of fall flavors delivered in the cold smoothness of an ice cream. Five spice powder is a Chinese seasoning that is designed to balance five flavors: sweet, sour, bitter, pungent, and salty. Exact blends vary, but the usual ingredients include star anise, cloves, cinnamon, Sichuan pepper and fennel. It’s a blend that can work beautifully in either sweet or savory dishes. Here, it punches up the flavor and provides a warmth and complexity to the squash/maple combination. I bought my bottle of Five Spice Powder at Whole Foods (where it was only $2.50), but you might also look for it at Asian grocers or online. 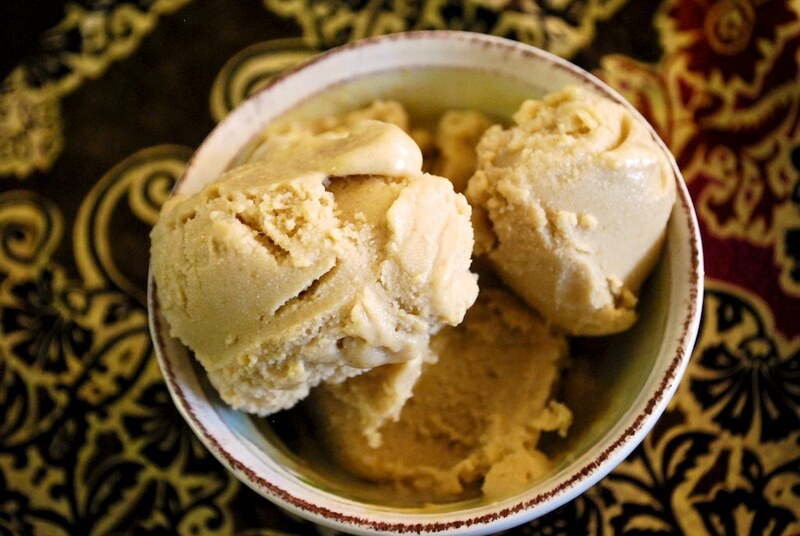 If you really can’t find it, try this ice cream anyway, with a teaspoon or two of pumpkin pie spice substituted in. If you are new to ice cream making, I have a few general tips. First, make sure your custard base is thoroughly chilled before you try to add it to your ice cream maker. This is important to ensuring your dessert will freeze properly. Do not use “low fat” products for ice cream making–stick to full-fat soy milk and soy creamers. The fat prevents the ice cream from freezing solid, and the recipe I’m giving here is already quite a bit healthier and lower in fat than your usual ice cream. A little bit of alcohol can also help maintain a soft consistency; I use a tablespoon of rum, which complements the flavors. To discourage ice crystals from forming on your finished product when you freeze it, press waxed paper or plastic wrap directly onto the surface of the ice cream, and then seal your container over that. Try storing the ice cream in the door of your freezer, where the temperature may be a bit warmer. And lastly, remove the ice cream about 10 minutes before you want to serve it. It will soften up on the counter and be easy to scoop when you are ready for it. Hope you enjoy this fall treat as much as we have! 1. Stir together 1/4 cup soy milk and arrowroot in a small bowl. Set aside. 2. Add remaining milk, creamer, 5 spice powder, sugar, syrup, and salt to a small saucepan. Heat over medium, stirring frequently, until bubbles start to form. Remove from heat and immediately stir in the soy milk & arrowroot mixture. Add the squash puree, vanilla and rum. 3. Chill in your refrigerator for at least three hours or overnight. Freeze according to your ice cream maker’s instructions. If you do not have an ice cream maker, you can try following David Lebovitz’s or Serious Eats‘ alternative techniques. NOTE: You may use either fresh roasted squash for this or canned pumpkin. Don’t use canned pumpkin pie mix though. For fresh squash, roast it at 350 degrees for about 1 hour, or until quite tender. Discard the seeds and stringy center of the squash. Then scoop out the flesh, put in your blender, and process until completely smooth. This entry was posted in dessert and tagged butternut squash, five spice, ice cream, maple, pumpkin, recipe, soy, vegan. Bookmark the permalink. Such a creative recipe! I can only imagine what the flavors are like! Great job. 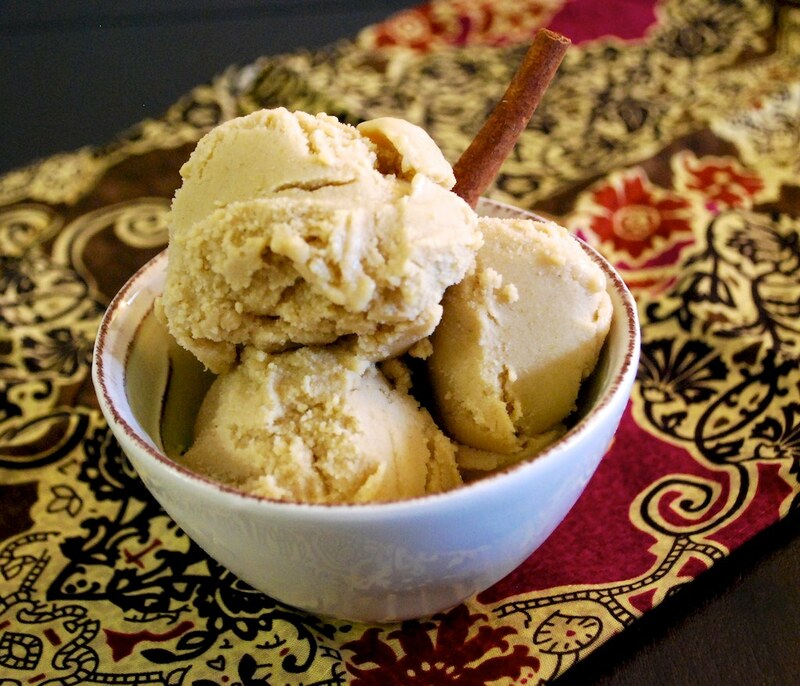 I love pumpkin-flavored treats this time of year, and this ice cream sounds fabulous! I like the idea of using butternut squash, too. I find that the difference between butternut and pumpkin is undetectable in most dessert recipes. Which is good for me, because I got 25 pounds of butternut squash in our farm share two weeks ago, and so many recipes just call for pumpkin! I would encourage experimentation with whatever winter squash finds its way into your pantry. Everything about this looks so delicious, maple and pumpkin, so good and love the addition of Chinese 5 spice, it’s one of my favourites but have never used it in sweet cooking!! Thanks for dropping in over a Veggie num num! I think this must be the tenth time I’ve looked at this post, lol. I’ve now made the puree and will get in the other ingredients tomorrow – I have a whole host of pumpkin treats in store but am really looking to making and eating this one! I love pumpkin ice cream but I think your addition of Chinese 5-Spice would really make the flavor pop. Sounds delicious.